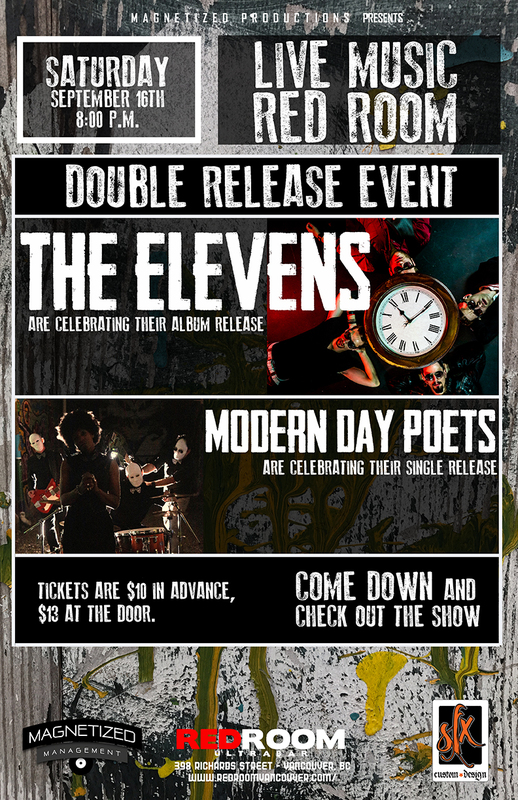 The Elevens are celebrating their Album release and Modern Day Poets are celebrating their Single release, come down and check out the show! Doord @ 8pm - Tickets are $10 in advance, $13 at the door. THE ELEVENS are a Vancouver-based rock band formed in 2013 by Arik Dicks, Troy Giffin, Mike Costea, and Brennan Buglioni. THE ELEVENS bring a crisp, energetic sound that incorporates elements of alternative, blues, and classic rock. Think of influences like The Red Hot Chilli Peppers, Jack White, and The Strokes. With rich, swaggering vocals, eclectic riffs, and a groovy rhythm section, THE ELEVENS deliver a true-to-form Rock and Roll experience that is sure to get people moving. MODERN DAY POETS (aka MDP or The Poets) commend powerful music to make the masses go ballistic. Curated with a mix of raging vocals, blues guitar riffs, beastly rock beats and a funky bass, MDP has been hailed as "heavy rock from the north" (CXCW). The band has been recognized by industry professionals as genre-bending and undeniably unique. Since forming in Vancouver, BC, in 2015, The Poets have been making a name for themselves across the Pacific Northwest.